Daters with knurled wheels for easy adjustment of bands. All models are furnished with wooden handles, deep moulded rubber bands and chrome-plated steel frames. As above, but self-inking. Simply push down on the unit to operate. The date bands are automatically re-inked each time you operate the unit. The S120 and ES400 are lightweight plastic units. 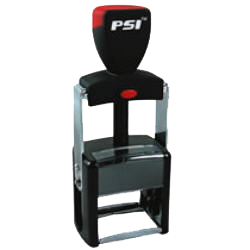 The Size 0 to Size 3 units are heavy-duty with metal frames. Pricing, which includes ink pad, available upon request. The compact and efficient design of these daters make them a very popular choice. Date is in the center of the stamp. Custom text can be added above and below the date. The 4850 dater allows for custom text above the date only. 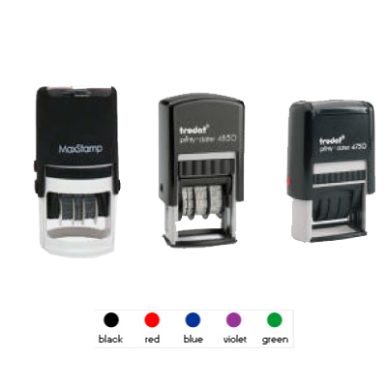 Replacement ink pads available. Pricing, which includes custom rubber die and ink pad, available upon request. Stamps a quick, clear impression. The date and custom wording are automatically re-inked each time you operate the unit. Simply press down on the unit to operate. Date is in the center of the image. Custom text and logos can be added above and below the date, with or without a border. 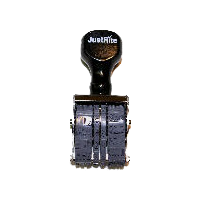 Durable construction and ease of use make this series one of most popular date stamps on the market. Replacement ink pads available. Pricing includes custom rubber die and ink pad, and is available upon request. Ideal for and commonly ordered by banks. Lightweight yet very strong and can take a beating! Ideal for incoming/outgoing documents. 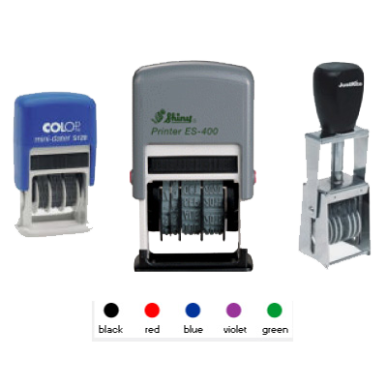 Die Plate Date Stamps offer a feature that makes changing the date quicker, easier and less messy than typical Die-Plate Date Stamps. Simply flip open the die-plate and turn the knurled wheels to advance the date bands. Date is in the center of the stamp. Custom text can be added above and below the date. Also available in 12- and 24-hour date stamps. Pricing includes custom rubber die. Stamp pad extra. Prices available upon request. For imprinting a variety of time, date and message combinations. 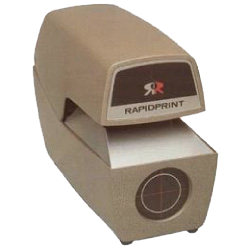 Prints automatically when paper is inserted. Solid-state electronic circuitry assures consistent impressions. 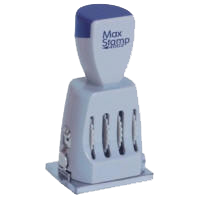 Adjustable stamping force for multi-copy forms. Easy change ribbons advance and reverse automatically. Rugged die-cast case has a sturdy lock to prevent tampering. Solid brass type wheels provide superior imprint and durability. Fixed die plates can be custom-engraved to your specifications, including your signature or logo. Use for incoming mail, tax receipts, phone messages, lab reports, court documents, restaurant guest checks, stock transaction documents, etc.